Early on Tuesday morning, Donald Trump fired off two tweets that served as his latest salvo against so-called "fake news," taking care to mention and tag major, "failing" institutions like the New York Times and the Washington Post. A few hours later, though, some curious news came out: The Post reported that the walls of no less than four of Trump's golf clubs play host to a framed cover of Time magazine featuring Trump. 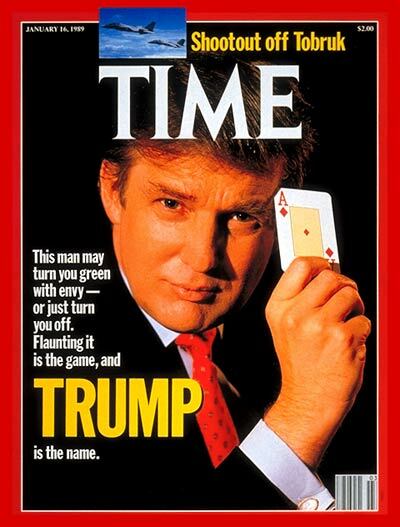 Oddly enough, though, instead of displaying his actual 1989 Time cover that read "this man may turn you green with envy—or just turn you off," Trump opted for a version that, as the two characteristic exclamation points splashed across the issue readily suggest, happens to be fake. The issue in question is dated March 1, 2009, despite the fact that there wasn't actually an issue of Time released that day. There was, however, one released on March 2, and some of its cover lines appear on the fake Trumpian edition, which replaces Kate Winslet with a much beefier blonde who would one day become president of the United States. March 1, 2009 did happen to be the season eight premiere date of The Celebrity Apprentice, which the issue takes care to shout out with the fake cover lines "The 'Apprentice' is a television smash!" and "TRUMP IS HITTING ON ALL FRONTS...EVEN TV!" “I can confirm that this is not a real Time cover,” Kerri Chyka, a spokeswoman for Time Inc. told the Post, stating the obvious. For all of Trump's respect for Andy Warhol, he doesn't seem to have enlisted an artist or even a decent Photoshopper to create the cover, which is essentially a pastiche of a portrait of Trump and the generic templates typically used for photos taken at a bar mitzvah, or inside a photo booth. In the sort of sloppy incompetence we've come to expect from Trump's administration, even this fake cover gets all the basics wrong, including the magazine's typeface, borders, and cover line placements. Still, the covers do make for some consistency across Trump's properties; they fit right in with the photos of himself from various news sources reportedly covering his office at Trump Tower. And they fit in even more with the State Department library in Washington, D.C., where Trump has proved himself an expert at controlling his own narrative: Shortly after his administration began, it appeared that he'd filled the space's entryway with entirely Trump-related books.